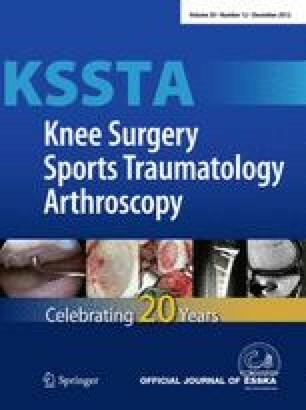 The purpose of our study was to evaluate the initial fixation strength of bridging techniques compared to other suture techniques for rotator cuff repair using a biomechanical animal model, which incorporated pretesting of intact tendons. Seventy-six fresh bovine shoulders were used for testing seven suture configurations including simple suture (SS), mattress suture (MS), Mason-Allen (MA), modified double row (mDR), SpeedBridge (SpB), SpeedBridge with medial fixation (mSpB), and double-mattress SutureBridge (dmSuB) techniques. Cyclic loading was performed with all intact bone-tendon complex before (pretest) and after repair of the tendon (main test) at the level of 10 and 180 N at 100 Hz with displacement-controlled ramps of ±33 mm/s. The pretest was stopped after 200 cycles. For the main test, the loading scheme was continued for a maximum of 500 cycles or until failure. The mean elongation of all 76 intact tendons measured at the pretest was 3.8 ± 0.6 mm (2.4–5.4 mm). No differences of gap formations at the 1st cycle were detected between SS, MS, MA, and mDR. SpB showed significant higher gap formations compared to all other suture techniques (p = 0.001). No significant differences were detected between mSpB and dmSuB, whereas both techniques were significant different when compared to the other groups (p < 0.05). In this study, results showed that bridging techniques with medial fixations have superior initial repair strength compared to other suture techniques. Knowledge of initial fixation strength of rotator cuff repair techniques may be of informative value to the surgeon.